My aluminium Swift is now 7 years old, still going as perfect as ever, but I don't expect it to last forever. More and more I fear the spectre of frame cracks. I haven't found any, but I haven't made a detailed minute search either. From what I learned about aluminium, it is just a question of time. And 7 years is actually not a bad innings. So more and more I am turning over in my mind what to replace it with. One thing is very desirable for me, that is a titanium frame. 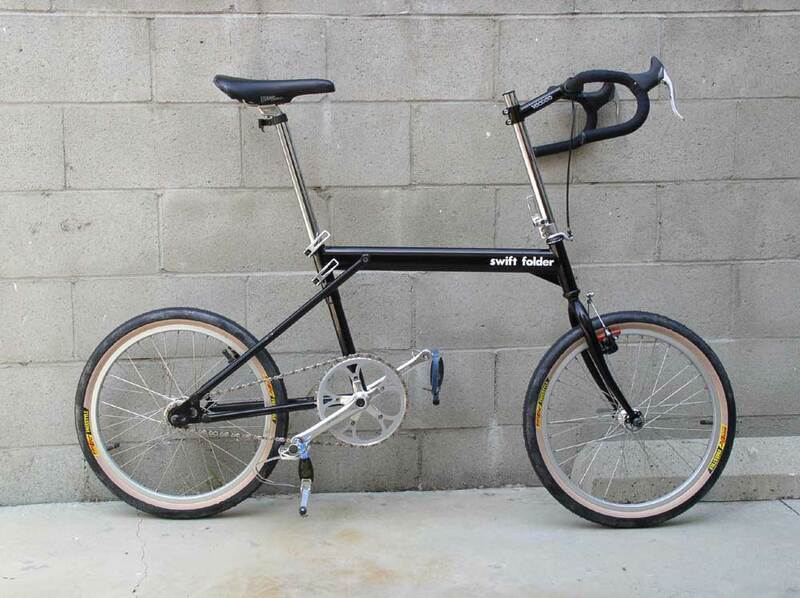 But buying a titanium folding bike such as the Hasa F1 is not for me. For one, I am not sure about the ride quality compared to my near-perfect Swift. I could probably arrange a test ride but I am not really interested. Want Swift. So I am talking to a titanium bike frame manufacturer, with the idea of them making a Swift-like frame in titanium. There are copy-right issues, so I intend asking Peter Reich about the idea. He might even be willing to furnish me with drawings, who knows. This brings me to the purpose of this thread: Are there other interested parties? It may be that buying more than just one custom job would result in substantial savings per frame. 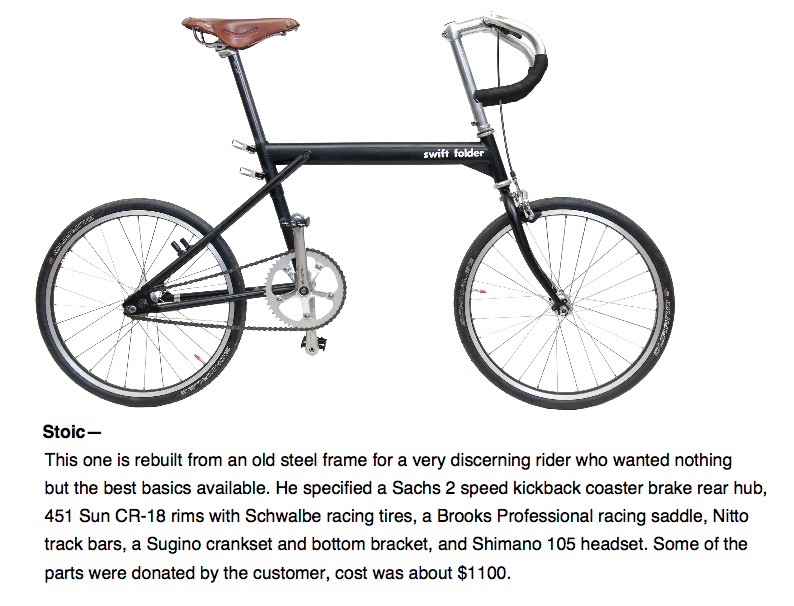 I have not gotten to the stage of a quote yet; I am guessing (hoping, actually) perhaps $1500 for the frame which would include a matching fork. One of the items I intend changing is the top tube length. Current length is about 55-56cm, size medium. I really want to add about 20mm to that for a less cramped cockpit. This will be a bike for the rest of my life. Perhaps yours, too? Let us see how interest goes. I am quite determined to go through with this myself regardless of other interested parties. I am not going to make anything out of this either. Cost price only. you should definitely contact reich...something interesting may come of the conversation.. I have nothing against your plan to have a titanium version of your bike - sounds like something I'd like to have as well. But I am skeptical about the idea that one frame material is inevitably going to fail and some other material will be immune. In normal use any bike frame is going to be subjected to stresses above the nominal fatigue limit - so given enough use it will eventually fail. But 'enough use' may well be more use than it gets in the lifetime of its owner, or it may fail much more quickly due to some flaw in the material, manufacture, or design. My personal experience is that I've only had one aluminum bike (and it's not a folder) - a 25 year old Cannondale with 125 kmiles and no failure. OTOH, my steel-framed folder had a frame crack develop with only about one tenth the mileage of the Cannondale. Fortunately the manufacturer was very good about fixing the problem and got me back on the road quickly and at no cost to myself. If you want a custom made Ti folder because you think it will be totally *****in' then go for it. If you want one because you fear your Al frame will fail in the nebulous future, because of some alarmist nonsense you read on a message board, you are just being a silly goose. I just googled "titanium bike frame crack" and the results have extensively revised my opinion of the assumed "bike for life" aspect. I was under the impression they are almost cyclist-proof. Maybe I will just strip the paint off my Swift and get a new paint job or just polish it. I polished a bike frame once, and when I didn't want it any longer and ebayed it, guys were falling over themselves bidding on it. Basically, I wanna Bike Friday Silk that isn't made by dirty hippies in Oregon. Which definitely also rules out the HPM Swift. And while it's not that I don't love BF's unironic use of the Comic Sans MS typeface (I truly do), everything else about their brand image makes me want to club baby seals, buy stock in Halliburton, and run straight pipes on my motorcycle. And they cost too much. Alas, the Silk ticks all the boxes for me feature-wise. Sigh. In my years posting on this forum, even with as much as I have learned about the mechanics, politics, culture, lifestyle aspects and health benefits of cycling; I believe that paragraph above is the single greatest thing I have read here on BikeForums. I nearly blasted a mouthful of coffee onto my computer screen while reading that. Thasiet... Cheers to you, good sir... cheers to you. i don't get it... what does this even mean? Agreed. I have the same sentiments about Harley;soo many poseurs who think black and orange are Harley's colors. I'll never sell my FXDX since I doubt they'll ever make a replacement. Some people ride a bicycle,some ride a statement. Basically, I wanna Bike Friday Silk that isn't made by dirty hippies in Oregon. Actually only the owner of the company is old enough, & he has a daughter in the 30's at least ..
the people doing the work are much Younger. Gen X or so ..
1) Those of us that are taller (or shorter) than average find that Bike Fridays are a folder that fits very nicely. They are also easy to modify with Std parts, but that's another thread. 2) The comment regarding being made by "dirty hippies in Eugene" is the equivalent of someone saying they would never ride a Trek, or a Giant (or anyone of a number of other well-known brands) because they are made by "low-paid foreigners". We ride Fridays (as readers can see), our daughter graduated from the U of O, and we owned a home in Eugene for 6 yrs, so we have a better than average knowledge of the city. Eugene is the 2nd largest city in OR (156,000 population), and while considered more 'counter culture' than many other places in the country, it is not simply a hippy enclave. Inferring that Green Gear itself is sort of a 'hippy-dippy' operation, ignores the fact they are a very well-organized and successful small manufacturing operation right here in the U.S. Turns out my fears are realised. I installed a new drivetrain this weekend and while cleaning the frame, found one seatstay is cracked halfway around on the underside where it is welded to the seat tube. This is known as the weakest spot on the frame. Sorry to hear that, find a good TIG welder and get it fixed. If its a concern you can always reinforce the area with aluminium alloy plate welded on. Good luck. Bad luck Jur. Sorry to hear that. Is it worth it (or even possible) to re-weld the frame? The result of middle-aged pedal power??? Hope it can be fixed; I know you like that bike a lot. As one gets older, I would guess the moral is: "Wear your cracked frame as a badge of honor!" 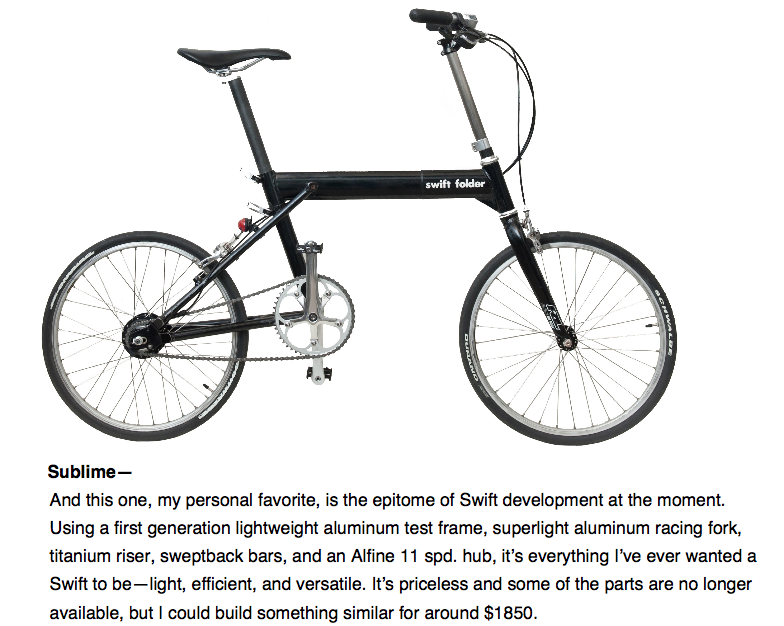 Curious what the response will be for the warranty on the swift -- it's lifetime, right? Weren't there several issues with the quick releases, if not being properly synchronised for clamping the seatpost, might develop a fatigue differential ? Titanium shouldn't be so expensive, it seems others going with companies like XACD before were paying in the $800 for custom design. Granted the jig would be different for a swift-a-like, and the large oval tube would be weird. But same issue as others mentioned with no warranty or insanely expensive warranty with return shipping, and probability of crack developing if not perfectly engineered and fabricated as it's design seems to place stresses more telling of fabrication than a normal double triangle bike might. As I think most alu frames go through a post weld heat treatment process, why would you suggest a repair is as simple as just TIG'ing it? Inducing so many heat related issues on an already delicate zone with a high thermal conductivity metal? When building a bike frame from scratch the the tubes, the machined or forged parts are all at a different temper and the welding creates another different temper. After the frame is welded it is annealed to attain the same temper throughout. Best practice would be do a post welding heat treatment process to restore the desired mechanical properties of the material back to how they were before the welding so you don't get a difference between the area of the weld and the rest of the tube. There is no reason why a after a repair has been made it couldn't be given a similar heat treatment. There is no reason why a after a repair has been made it couldn't be given a similar heat treatment. Except that what you proposed would cost more than replacing the frame.... A backyard TIG welder isn't exactly going to have a heat treatment furnace size capable where they'd want to bring this to T5 or T6, let alone does any of this mean you'd want to ride what's been mucked together and under any radar of security. Remove all components, clean paint, repaint, etc. Rarely see it advised to repair alu frames unless they have significant sentimental value, definitely not for USD$700 off the shelf frames that have a lifetime warranty. I don't think it would need the whole frame treating, just annealing locally in the area of the welded repair. Cracks in aircraft are welded all the time as part of regular maintenance but the entire aircraft is not re-annealed after. Each to their own but depending on how bad the damage is, if it was me I would give it a go, if the frame is scrap anyway and out of guarantee then why not. Obviously the frame should be checked regularly for damage but that goes for any frame, repaired or not. At the end of the day the choice is up to the owner of the broken frame, they have to decide if its worth repairing or not and weigh up the chances of any further crack appearing later. I hope jur comes back with the rest of the story. I'd like to hear how this turns out, and what Xootr had to say. TBH I dismissed the idea of warranty... maybe prematurely? I will contact them right now. I always like the steel Swift frames when Peter used to have them made in New Jersey! At a bike show in Manhattan, Peter's wife bike was on deplay in sky blue. That was my favorite color and nearly purchased it but Peter wouldn't sell. I always felt the Aluminum version looked cheap compared to steel. Years ago, I test rode the steel version and it was a hard ride. What a stiff frame compared to my Dahon's. Thanks @mark03 for pointing out the warranty issue. I contacted xootr and they responded positively right away. I was forwarded to Peter Reich who said this particular vintage Swift frame was made from thinner tubing which could lead to the crack I have (and was posted by someone earlier some years ago). So he was adamant I will get a replacement, all good. I feel a bit of an idiot I didn't think of this myself. On the titanium frame front, the company I contacted are all away at Chinese New Year now, so another week for them to get back. Peter Reich did give me permission for having one Ti frame built successfully, so if there were more takers, we would have to work through him how to swing that forward. He thought it would be uneconomical.